We do not have many recipes from the ancient world and certainly none presented in the user-friendly format found in today’s cookbooks with precise measurements, cooking times and images of the finished product. Some ancient recipes are found at the end of agrarian handbooks, like those produced by Cato the Elder (234-149 BC) (for more see Catherine Draycott’s post https://recipes.hypotheses.org/5005), while others are described as part of a philosophical dinner party (Athenaeus’ Deipnosophistae). The most famous recipe book, and the one which most reconstructed Roman recipes are based, is Apicius’ De re coquinaria or On the subject of cooking. Compiled sometime during the 4th century AD and named after an infamous 1st century AD cook, it contains recipes for vegetables, pulses, meat, seafood and game. Ingredients are listed in the text along with rough instructions for the preparation and cooking of the dish (think instructions for the technical challenge in The Great British Bake Off). The lack of ingredient quantities suggests that it functioned as part coffee table book and part chef’s manual, whereby the cook already had a good understanding of ingredient combinations and quantities. In other words, it was not for the beginner home cook. Despite a lack of precision and clarity in these surviving recipes, it is possible to gain a detailed understanding of the sensory experience involved in the preparation and consumption of these dishes. This is due to the survival of several pieces of Roman kitchen equipment and at times, the food remains themselves. 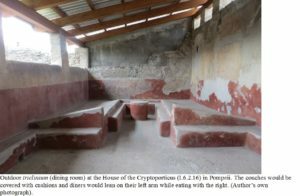 At sites like Pompeii and Herculaneum (Italy), which were destroyed by the eruption of Vesuvius in AD79, we not only have cooking pots, plates and serving dishes, but also the remains of the kitchens and dining rooms where the food was prepared and eaten. So what was it like to make and eat Roman food? Let’s look at one of Apicius’ recipes in detail. Lentils with mussels: take a clean pan, (put the lentils in and cook them). Put in a mortar pepper, cumin, coriander seed, mint, rue, pennyroyal, and pound them. Pour on vinegar, add honey, liquamen, and defrutum, flavour with vinegar. Empty the mortar into the pan. Pound cooked mussels, put them in and bring to heat; when it is simmering well, thicken. Pour green oil over it in the serving dish. The first thing you may notice about this dish is the vast number of flavours and seasonings involved. In addition to the various herbs, the recipe also calls for liquamen, a fermented fish sauce similar to the Thai fish sauce Nam Pla, and defrutum, concentrated grape syrup made from boiled down grape juice. Roman dishes are notorious for their seemingly strange and startling mix of flavours. However, before we get to the taste, let’s start with sensory experience of preparing this dish. 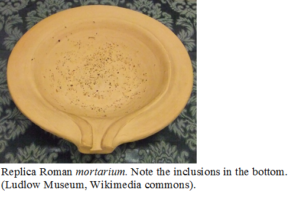 Firstly, let’s assume that this dish is being prepared for a dinner party in a wealthy Roman household. If you were the one making the food you would have been a slave, working in a hot, small, smoky kitchen. Roman kitchens are readily identifiable by their large ceramic hearths. Cooking took place on the hearth; the space beneath is just for the storage of fuel, usually charcoal or wood. 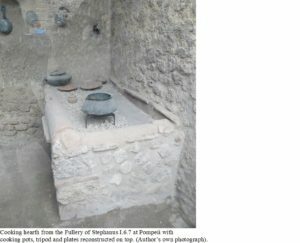 The lack of chimneys in Roman kitchens means that there was poor ventilation and the smell of the cooking food would have been quite strong. The small size of most kitchens, even in larger houses, meant that the room would have been hot, even in the winter. At least two pieces of cooking equipment are required to make this recipe, a pan and a mortar. The mortar would have been a mortarium (image), a large shallow ceramic bowl with stone inclusions in the bottom to provide a rough grating surface. All the seasonings would have been ground by hand using a mortarium and wooden pestle. The pan (perhaps made of bronze) would have been placed on a metal or ceramic tripod with charcoal underneath. The varying materials of the mortarium, pestle and pan would have made the tactile experience quite dynamic. Once the dish was finished, depending upon the wealth of your owners, you would have poured the finished product onto a ceramic, bronze or silver platter. You’d then promptly move on to preparing another dish as Roman dinners usually consisted of several courses. Now let’s shift gears and say you’re a guest at the dinner party and you have the opportunity to taste and smell this dish. The combination of flavours in this recipe, and particularly the mixture of the liquamen, defrutum, honey and vinegar would have given it a sweet and salty taste. In my experience, having made several Roman dishes, the flavour combination is strange but not jarring or unpleasant. Roman food tasted much more like modern Thai or Chinese cuisine than modern Italian with its frequent combination of sweet, sour, and salty. The black pepper in the dish, imported from India, would have provided a hint of wealth and exoticism as it was by far one of the most expensive and foreign seasonings you could use at this time. If you had grown up consuming a Roman diet then this dish would have smelled and tasted very normal to you. The herbs, in addition to appearing in numerous other Apician recipes, are also frequently mentioned by other ancient authors, suggesting that they formed an important part of the Roman diet. This importance is confirmed by the recovery of many of the herbs, and in particular coriander, at sites throughout the Roman Empire. The military and merchants carried and imported these herbs to all the corners of the Empire, perhaps to evoke a taste of home. Some individuals native to the northern provinces, such as Gaul and Britain, adopted these seasonings into their local cuisines. In addition to probably enjoying the taste, they used them to display their wealth or allegiance to Rome. In sum, there is much sensory information that can be gleaned from Roman recipes and the archaeological remains of food preparation and consumption. What is perhaps most striking is the vastly different interactions and experiences of those in the kitchen compared to those in the dining room! Grocock, C. W. and Grainger, S. 2006. Apicius: A Critical Edition with an Introduction and an English Translation of the Latin Recipe Text Apicius. Totnes: Prospect. Livarda, A. 2011. ‘Spicing up life in northwestern Europe: exotic food plant imports in the Roman and medieval world.’ Veg Hist Archaeobot, 20(2): 143-164. Livarda, A., 2018. 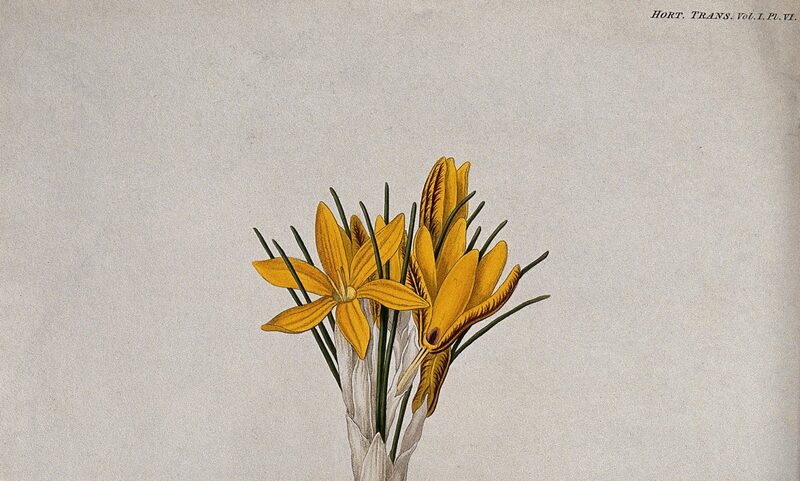 Tastes in the Roman provinces: an archaeobotanical approach to socio-cultural change. In: K.C. Rudolph, ed. Taste and the Ancient Senses. London: Routledge. pp. 179-196. Rowan, E., 2017. 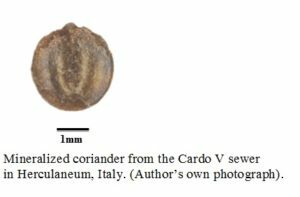 Bioarchaeological preservation and non-elite diet in the Bay of Naples: An analysis of the food remains from the Cardo V sewer at the Roman site of Herculaneum. Environmental Archaeology, 22(3), pp.318-336. Erica Rowan is a lecturer in Classical Archaeology at Royal Holloway, University of London. As a Roman archaeologist with a specialization in archaeobotany, her research focuses on Roman diet and consumption practices. She uses literary, archaeological, and archaeobotanical evidence to explore the way cultural tensions within Roman society were expressed, embedded, and resolved through the prevailing food culture.